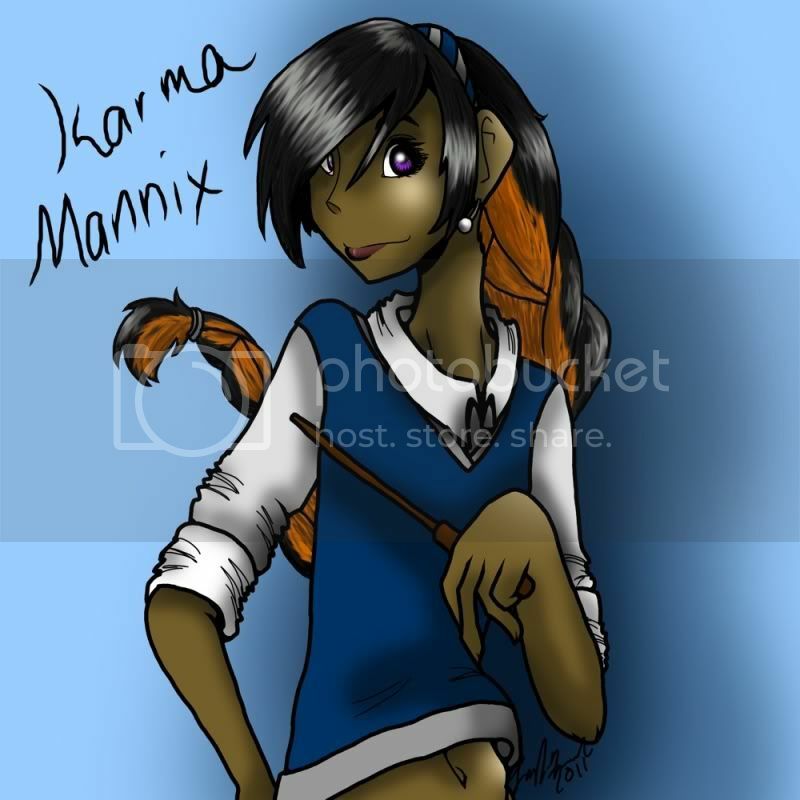 KarmaMannix aka Karma Mannix is a 26 year old (DOB: August 24, 1992) half-blood wizard living in Hogwarts. He wields a 13" Hazel, Dragon Heartstring wand, and is a member of the unsorted masses of Hogwarts students just off the train eagerly crowding around the Sorting Hat. His favorite Harry Potter book is Harry Potter and the Deathly Hallows and his favorite Harry Potter character is Luna Lovegood. Karma Mannix is a first year student, who also happens to be a werewolf. He is on the shorter side, around the same height as his female classmates. However, the fact that he is male is kept a secret, as he prefers to be considered female (transgender, or femboy), but is forced to live in the boy's dormitory for now. He has dark walnut skin and long black hair with the underside a bright orange, usually in a long braid, and dark violet eyes. His figure is feminine, with naturally wide hips. At this point, he has his eyes on Hugo Weasley, but isn't pursuing, as he believes he will get rejected if he tries.